Here are some free network simulator software for Windows. Using these software, you can simulate a real home or corporate network in an easy way. The software that I have listed below let you use different network devices like routers, switches, cables, PCs, terminals, repeaters, and some others. Using all these tools, you can design a real world network model and then simulate it. You can trace the packet transfer between different nodes and then analyze its working. This is useful in setting up an internet environment in an office or at any other place. The network design that you create can be exported to a file as well. Network simulation can be useful at many places. If you are beginner in networking or planning to clear some exams like CCNA, then you will surely need some tools to understand the basic network devices. Also, before designing a network structure, you can use the simulation tools that I have mentioned below. You will find a lot of devices in these software of various models. You can align them on the workspace and then connect them through various cables and analyze the network traffic. 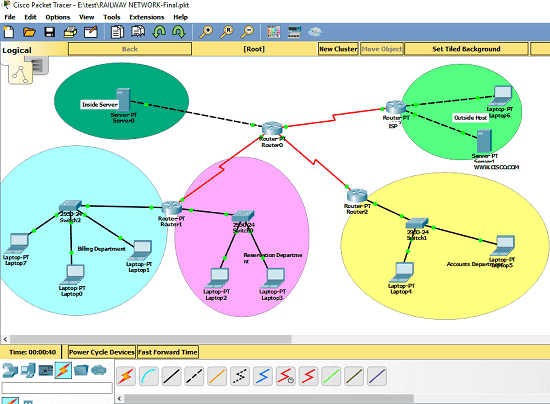 Cisco Packet Tracer is one of the best free network simulation software that you can use. Basically, it is used for training network professionals and it is quite old and popular as well. It offers a large number of network devices like routers, hubs, switches, terminals, etc. You can use those devices and then form a network according to your needs. After that, you can connect the devices through the dedicated cables. After setting up the network model, you can simulate it. You can check the connectivity at any node. You can ping any host from any point and then see the ping stats. Also, if you want to block some devices or hosts from pinging each other then you can do that. However, for that, you will need to have some basic knowledge of networking (especially routing). 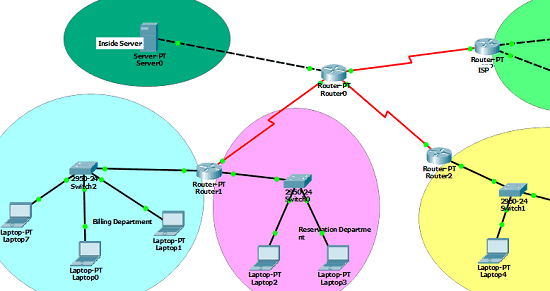 Cisco Packet Tracer is quite a powerful tool as well that you can use to simulate a network. To get started with it, you will have to create a free account on Netacad which is a Cisco Networking Academy. After that, run this software and then log in with your Netacad account and start using it. All the networking devices are in the toolbox of the software. You can add them by simply selecting them from their respective category. You can even set the different configurations for the different devices as well. When the scenario is set up, it will automatically get all the devices online. You can see a green dot at every node and it means that a device is online. Also, when you see a red dot at any node, it means that there is connectivity issue. The issue could be anything related to the wire connections, improper device configuration or anything else. You can find that and fix it. And when you want to save the current scenario, you can save it as a packet tracer project and later import it back for editing. 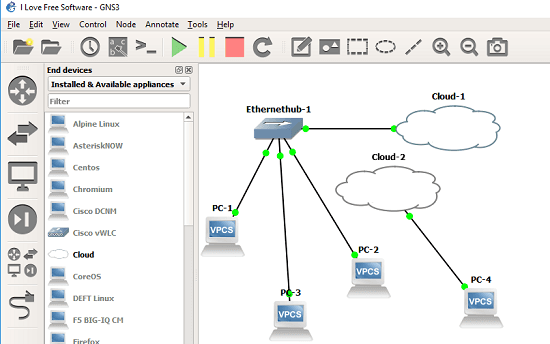 GNS3 is another free network simulator software that you can try. It is actually more advanced than Cisco Packet Tracer that I have mentioned above but quite complicated for newbies. There are a lot of features in this software related to network simulation that you can try. You will find all the networking devices like host computers, terminals, routers, switches, cables, cloud, NAT, and so many others. You can create a network design by using these devices and then simulate the final network. Apart from this, there are other advanced operations that you can perform on the network you create. You can opt to capture or filter network packets at any node. The software is simple and comes with several other software to assist you with the network simulation. However, all the tools are not necessary if you just want to simulate a network by adding different devices. You can exclude other software during the installation process. Next, open the software and you will find all the components on the left side. You can create a project and start creating your design. Drag a device from the left side on its interface and then you can connect them through the cables. And when you connect them all, you can put all the devices online by clicking on the play button from the toolbar. When you make all the devices online, you will see a green dot in front of each node. That indicates that there is no connectivity problem. And if you see a red LED at any node then you will have to fix the connectivity issue there. After that, you can use the network filters or packet capture tool. For that, just right click at any point and then use the context menu options for that. There are other devices which can be used in the design but they require a VM to be installed and enabled. Since, my PC doesn’t support virtualization so I wasn’t able to do that. But if you have a PC or laptop with high configuration then you can try that. These are the best free network simulator software that I could find. You can use any tool from above and simulate a network by adding various devices and hosts. Both the above software are good for designing and simulating complicated networks pretty easily. So, if you are looking for some free network simulator software, then you can try any software from above and let me know what you think about them.